A lot of my friends, fans and rabid readers look to me as the go to guy for their tech questions. If you don’t know already, I am a closet geek. I started a computer repair company called The Nerd Herd in 1998-1999 before some Suit at NBC stole it and used the name on a popular T.V. show, Chuck. That’s my story anyway and I am sticking to it. Today I want to talk about the much ballyhooed iPhone 4 operating system update that allows for a WiFi hot spot. The update took almost three hours to download on my computer. I think a lot of that has to do with a pretty slow broadband connection up here in the middle-of-nowhere-Alaska. As usual, once the update is downloaded you must sync your iPhone to the computer and iTunes. Once sync’d you go into the myAT&T app on your iPhone. If you have not downloaded this you need to and you need to create an account. If you do not remember you password from when you signed on with AT&T you will have to call them and get it. You then choose DataPro 4GB. 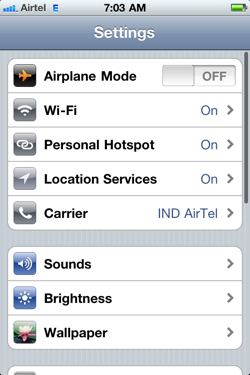 This is required for the tethering or personal hotspot feature on your iPhone 4. It will set you back an extra $20.00 a month but you do get 2 more GB of data. The plan that most people use is the 2GB data plan. To use personal Hotspot for the first time, go to Settings > General > Network > Personal Hotspot. Turn on Personal Hotspot by tapping once on the On/Off button. You will be prompted to enter a wi-fi password. You must create your own password of at least 8 characters. After entering the password hit Done. Next you will be asked how do you want to share the internet access. If the Wi-fi or Bluetooth radio are Off they will be turned on automatically. Your iPhone is now broadcasting a wi-fi network with the password you selected and the name of the network is same as that of your iPhone. Now go to any wireless device like your iPod Touch or laptop and look for networks. My Mac was pretty quick to discover it. you may have to turn the Airport off and then back on. The broadcast strength seemed strong enough. No matter where the iPhone was left in the room, the signal showed up pretty strong. Once connected, the iPhone will display a blue status bar showing how many devices are connected. The iPhone Personal hotspot feature will allow you to connect up to three WiFi devices (ie: an iPod Touch, a Laptop and and an iPad for example). You will notice that it automatically shuts itself off after an hour approximately if not used. The personal hotspot feature is very power hungry and will not go easy on the battery of your iPhone. In order to make the hotspot active again just visit the Personal Hotspot pane which is now in on the first page of your Settings app. In case you aren’t on a 3G network the hotspot will obviously stop when you make or receive a phone call. However, once the call is over everything resumes just like the call never took place. Overall, I loved the simple yet effective implementation including the power saving part. NOTE: You only have 4GB of data usage with the personal hot spot as well as any data you use regularly via 3G. This means DO NOT leave your personal hot spot on all day or use it to download large files, music, or videos. I use just to about my 2GB limit almost every month and I have it set up for AT&T to send me a text if I am above 85%. As with the current data plans, if you do go over, AT&T will charge you $10.00 for every GB you go over. What is also nice, is you can turn the feature on and off on your myAT&T app and you will not be locked into an extended contract. I do believe that if you use it only part of the month you will be charged for the full month, however. If you have questions about this, call customer care at AT&T. I hope this helps you out. If you have any questions please feel free to contact me on the comment page and I will get back to you as soon as I can. Thanks for the in-depth, but easy review and instructions. It was very helpful. WOW……. in UK we can get it on a unlimited data usually most of the iPhone 4 comes with an unlimited data which include the hot-spot. unlimited data cost around £6 which is almost 10$. just wondering, if im using the hotspot on my laptop and im on youtube and facebook, my contract says that its unlimited usage, does that mean for the hotspot as well? The data plan for a Hotspot enabled iPhone is 4 GB only! That same 4 GB is also shared amongst your daily usage (when not on the Hotspot). While AT&T says this is “unlimited” I can assure you it is not. Your 4 GB will be quickly used up if you download a lot of video or stream music from apps like Sirius or Pandora. If you do go over your 4 GB data limit AT&T charges $10.00 thereafter. is there an option to view the connected devices to my hotspot? I dont think there is. You will see on the top of your iPhone screen a blue bar that says something like: 2 devices connected or something like that.